When you watch a film like “The Drowned”, a couple things come to mind. One, you know these film makers are passionate about making movies and 2 they create products that truly represent the heart of low budget independent productions. Pagan Film Productions has created quite a few films simply using some motivation , a script and what equipment they have on hand. Your first impression is to be expected as the productions have a B-movie SD look to them. But getting that out of the way, they still have a story to tell and are serious about doing it. Our story centers around recently divorced Kate Williams and her return to Lake Merrow, a tranquil but mysterious area that has more than one old tale surrounding it. Upon inheriting her grandmother Jesse’s cottage, she quickly becomes re-acquainted with the area and the home that she visited often as a child. As the days pass, so does the frequency of weird occurrences, local tales and night time disturbances. The question really comes down to is she hallucinating or are the images from beyond calling out to her. A back story is given about a former cult under the leadership of bad holy man Father Merrow who led his followers in the belief of paganism rituals and the sacrificing of children to appease the invisible realm. The locals who finally caught on to their evil intentions took matters into there own hands by flooding the church and its inhabitants per the lake dam 200 years ago. In the re acquaintance with the local surroundings, Kate is befriended by former poet Edgar who entertains her with his knowledge of the area and its dark history. Shortly after, Kate begins to find strange objects near her home and see haunting manifestations that appear throughout the day. It probably doesn’t help that her neighbors tend to feed these eerie tales with there own take on the lake. Still she seems determined to tough it out and make a few discoveries along the way. If I were to sum up this film in one word, it would be quaint. Although the basis is that of a horror film or at least a new age ghost story, most of the soundtrack is filled with sounds of harps and celtic music. The music is quite good, though with that kind of soundtrack it instantly gives the film a certain feel that’s hard to ignore. Also the film appears to be written from old folklore with images and visions of the green man, pan and dragon skulls. More than once the legends of fairies are mentioned which also suggest the influence on the script. I believe that to be irish folklore, but I’m not entirely up on my mythology. Our main actress Stephanie Tanaka is charming and likeable on screen. At present I couldn’t tell if she had previous experience as the IMDB credits weren’t up. She played her role in the film pretty naturally so my guess was that she came from some theatre experience. FX and props were mostly store bought items and off the shelf makeup. Still however effective they may be, the image of ghosts and cretins emerging out the water can still be a jarring visual image. My favorite of course was the lady with the alligator teeth that reminded me of a character out of “Fright Night”. My thought here was that some filtering could have improved the presentation and curbed a bit of the video look so that you didnt ruin the effect with glimpses of runny face makeup. I feel this film was a pretty decent effort by the parties involved. The obvious lower production value might not appeal to BBuster renters who expect a certain look and feel , though it’s still worth a visit to get a true sense of an independent production. The story itself had a smart sense of subject matter and the film is safe enough to provide lighter thrills to a less horrific driven audience. 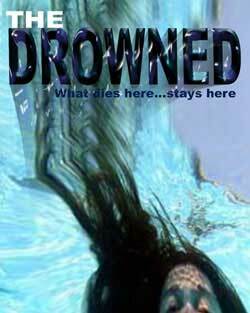 In an age where slaughter, torture and intensity has become a standard, “the Drowned” gives a welcome break to audiences with basic storytelling and a few creepy moments.